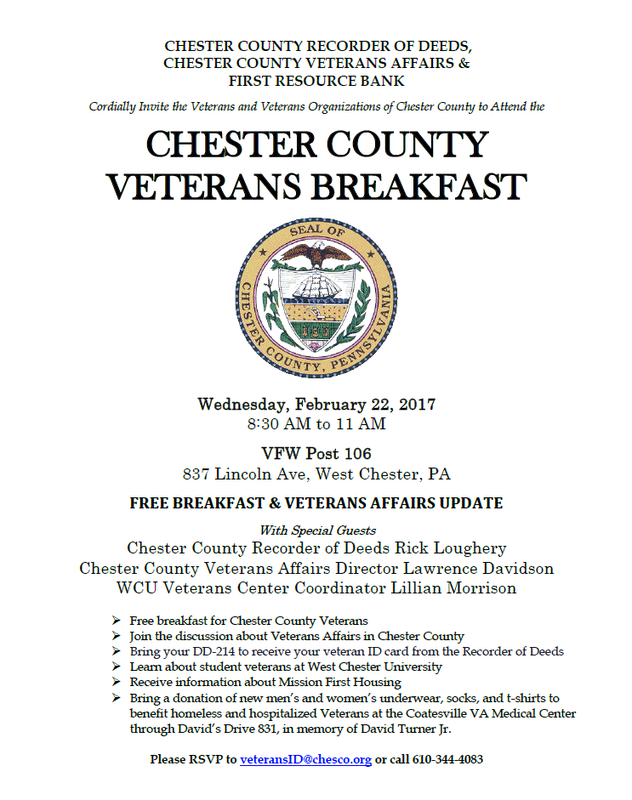 All Chester County veterans and veteran organizations are invited to attend a free breakfast, hosted by the Chester County Department of Veterans Affairs and Chester County Recorder of Deeds Rick Loughery. The event takes place on Wednesday, February 22, 2017 from 8:30 to 11:00 a.m. at the VFW Post 106, 837 Lincoln Ave, West Chester, PA. The breakfast is free and will include a discussion facilitated by Veterans Affairs director Lawrence Davidson on all services available to veterans in the County. Details of West Chester University’s student veterans program and Mission First Housing will be available, and attendees are encouraged to bring a donation of new men’s and women’s underclothing, socks and t-shirts to benefit homeless and hospitalized veterans at the Coatesville VA Medical Center, through David’s Drive 831. Any veteran who brings his or her DD-214 discharge papers to the breakfast will also be eligible to receive a veteran ID discount card from the Chester County Recorder of Deeds office. The veterans ID discount program offers savings at more than 100 business locations throughout the county. The free breakfast is sponsored First Resource Bank.